This fall, the Conner family returns to the small screen sans problematic matriarch Roseanne — a fairly big deal considering the show that catapulted them to fame was called Roseanne. But after being fired from the show that bears her name, Roseanne Barr hasn’t been quiet about TV’s much-anticipated spinoff, The Connors. In fact, she just revealed a fairly big spoiler on Brandon Straka’s Youtube show Walk Away. And she does not approve. The Conners debuts October 16 on ABC. No real Roseanne show fan plans on watching the Conners. Everyone I’ve asked says they have no interest in that new spin off. It will no doubt tank. No ones going to watch Roseanne without Roseanne. And the people that are glad she was booted because she supports the President, never watched the show anyway, so they’re pointless. I couldn’t disagree with you more. I watched the reboot series and honestly Rosanne was the absolute worst part about it. All those years away from the series has only made her acting (which was never that good to begin with) so much worse. I can’t wait for this re-re-boot. John Goodman and Laurie Metcalf? Who isn’t going to enjoy it???? You are wrong on every point. I watched and liked the reboot. I watched and liked the original. I chose to ignore Roseanne’s irrational twinning with Trump, both saying inane things they should not. I will watch the Connors to see if it is any good. I will continue to watch if it is, and won’t if it isn’t. 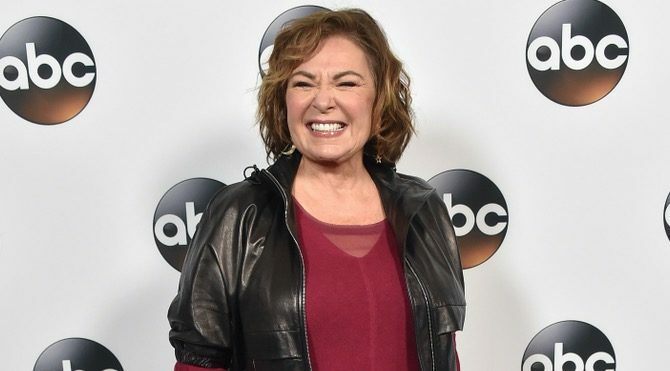 Roseanne shot herself in both feet because she can’t help herself from saying stupid stuff, just like the president. They are both tragic disasters who have worn out their welcome and have no do-overs left. I think it might do well. Even half of what it did last season ABC will be happy. Roseanne was the weakest link on the revival unfortunately. Oh look, the same anti-LGBT troll account that continually defends bigots is back on to cry that a racist isn’t going to be on the show. Funny, everybody I’VE asked said they’d ONLY watch the show if Roseanne wasn’t on it. So I guess both of our B.S. fake polls cancel each other out. The Emmys plummeted to all-time low ratings, even though the the three-hour awards show is supposed to be “television’s biggest night”. An average of 10.2 million viewers watched the Emmys on NBC, down nearly 11 percent from the 11.4 million who watched the gala last year, according to figures compiled by Nielsen. NBC tried to put a brave face on the figures, noting that audiences for this year’s Oscars and Grammys were down by wider margins. But it was difficult to spin the figures — the Emmys has been bleeding viewers for years, and the new host combo of “Saturday Night Live” regulars Colin Jost and Michael Che did not seem to win over new fans. Award shows have been sliding for a while now. Hence things like best blockbuster for the Oscars and the daytime emmys getting booted to online. All of these words in a desperate attempt to avoid the simple fact that Roseanne bled viewers when her pro-Trunp views came out. At the end of it’s season it was getting beaten by NCIS. But please, keep talking about whatever else you want. Old style television is dying. The few shows that are consistently doing well are also engaging viewers online through youtube, hulu, or independent streaming services. The reason is simple: cable television is an inferior service. I have to pay for the service every month AND I get shown unskippable ads? No thanks. I don’t care for sports, network news is available elsewhere online, and the critically acclaimed shows get put on the big streaming services within a year anyway. The decline in television ratings is a natural consequence of people opting for new media over an older and increasingly obsolete model. Soon enough the major networks will find some kind of hybrid model, or else go out of business, which is fine. Roseanne made headlines last year because the ratings made it look like network television could make a comeback, but it’s just a blip. The show would have lost ratings in its second year anyway. All shows do. Even if they had milked another year out of it they would have been out of ideas and jumping sharks to try to get their numbers back up to where the network wanted it. The Connors will probably be that extra year of milking their time, but unless they can knock it out of the park in their first season it will probably be cancelled, even with big name veterans like John Goodman and Laurie Metcalf starring.